The aim of this project is to develop a novel general-purpose corner detection algorithm. The study focuses on right angle corner which can be seen as Green functions of the partial differential operator DxDy. Many methods for corner detection exist but the originality of the present approach is to build a detector using differential operator formalism. The use of steerable filter allows to detect both the corner position and its angle of rotation. The project contains both theoretical and practical aspects. 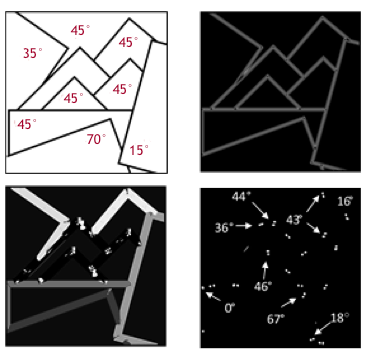 The mathematical counterpart includes the proper formulation of the corner detection problem, while the practical part mostly consists of implementing the method and evaluating its performance on synthetic and real data. Figure 1: Input image (top left). Image containing the computed steering angle for each pixel in the input image (bottom left). Image containing the magnitude of the filter response (top right). Corner position image after applying a global threshold on the filter response (bottom right).